Translated into English at the Translation Bureau of the Library of Tibetan Works & Archives, Dharamsala by Tsepak Rigzin, Tenzin Dorjee, Lobsang Dawa, and Jeremy Russell. ADVICE CONCERNING THE DHARHA PROTECTORS – extracted from an explanation of bLama mchod-pa given by His Holiness the Dalai Lama at the main temple in Dharamsala to a large gathering of Tibetan and Western disciples 2nd March 1986. “… he is surrounded by an ocean of protectors of the teachings.” Concerning the Gelugpa protectors, there are protectors of the people of the three scopes, Mahakala, Vaishravana and Kalarupa. In the center of the row is six armed Mahakala, the wrathful aspect of Avalokiteshvara, who protects practitioners of highest scope. Vaishravana is appropriate for those who observe pure morality, there is special reason for this, for although all protectors must be good for such people, Vaishravana is particularly pleased by purity. As those of middling scope are primarily concerned with ethical purity, Vaishravana is the appropriate protector for them. Those of lowest scope are primarily concerned with observing the law of cause and effect; and as Dharmaraja is the witness of wholesome and unwholesome actions he is their protector. As has been said “Dam-chen (Dharmaraja) treasures the judgment of wholesome and unwholesome actions more than his life”. So, in the Gelugpa tradition it is said that one should practise according to the presentation of the persons of the three scopes. 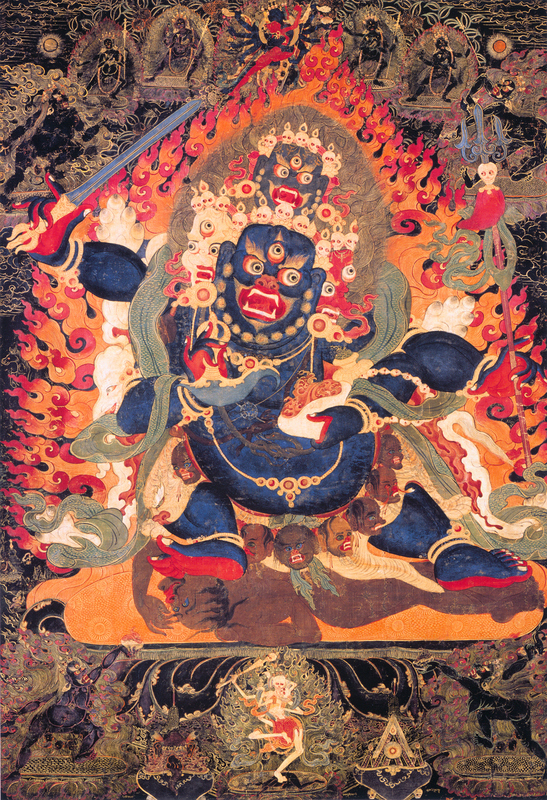 The most important protectors are Mahakala and Dharmaraja of which Dharmaraja is exclusive to the Gelugpa. It is he who is the Guru Manjushri, Yidam Manjushri and the Dharma-protector Manjushri. Among the external, internal and secret practices of Dharmaraja, the most important is the inner practice. Although Je Rinpoche also did the secret practice, the inner practice is the most important. These three being fundamentally important there is no need of a protector other than these for the Gelugpas. 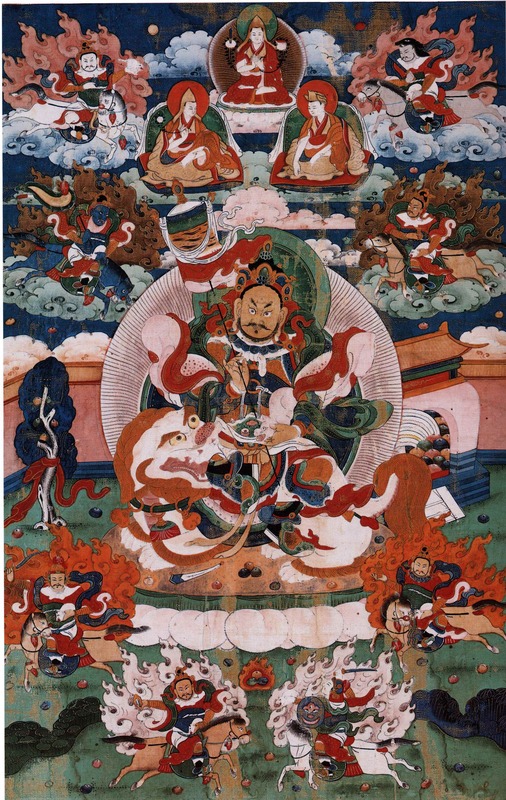 Amongst Mahakala, Dharmaraja and Vaishravana, Mahakala and Dharmaraja are the most important and of them Dam-chen Chögyal (Oath-bound Dharmaraja) is the most important. I used to say by way of a joke, “Gelugpas will only need to look for a new protector on the day that offerings and requests for prayers come because Dam-chen Chögyal is dead”. Until then Gelugpas do not need another Dharma-protector. This statement carries some weight. How could our teacher, Lama Losang Tu-wang Dorje Chang have attachment and aversion, feeling close to some and distant from others? Yet if a disciple makes a prayer such as, “You are our Lama, you are our meditational deity, you are our Dakini and Dharma protector” – he bestows blessings, doesn’t he? Similarly, whether it be a Dharma protector or a Dharma protector of the tenth ground, how could they have feelings of closeness and distance, attachment and hatred? – they do not. But from our side if we were to say “You are the one who accomplishes my pacifying virtuous activity and that of increase, control and force” , then there is a benefit isn’t there? It won’t do any good to rely on a new deity or any others while customarily accepting a Dharma protector who Je Rinpoche bound by oath and who was also specifically bound by Je Sherab Sengge. This is something to be examined, not merely accepted because it appears to be good. Nevertheless, some highly realized lamas do rely on various Dharma protectors according to their personal preference; this reflects their own inconceivable practice, but this is none of our business, is it? If I were to give an explanation according to the general Gelugpa tradition, as I have just said, while on the one hand there is much to say about the protectors of the beings of the three scopes according to the general outline of the path, when it comes to actual practice if one were to confuse east with west it would do no good, that’s the point. I have many things to say about this, as I’ve gained a lot of experience and I’m saying this based on my experience of many years of examination. 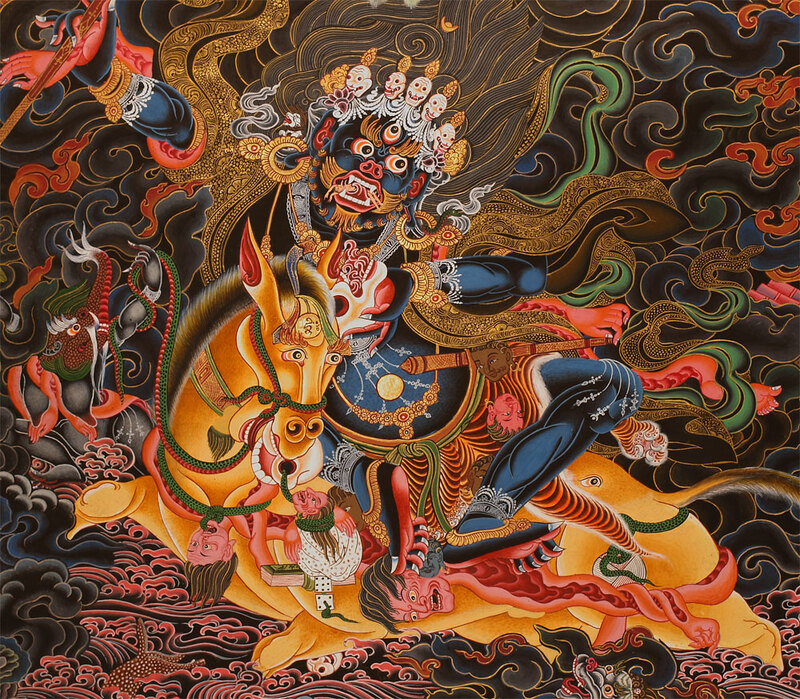 So, we take the protectors of the three types of beings as the principal and following this, the protector Four-armed Mahakala who is one of the principal deities actually attested by the tantras, then Gompo Gur (Panjaranath Mahakala ) and Gompo Shel (Chatranukha Mahakala) etc. Then comes Cham-sing amongst the host of oath-bound protectors Gompo Gur, Shel etc. One way of explaining Cham-sing is as Lord of the Furies (Wrathful Ones), but he isn’t one of them. Basically, among humans understanding another’s heart is achieved after attaining signs of irreversibility, however, generally speaking, it is very difficult to know another person’s heart, and in the case of protectors it is particularly difficult. Therefore, it is very difficult to place these kinds of protectors, some, the worldly protectors, are lower and some, the transcendental protectors, are higher. How can this be done? What reasons end sources can we rely on to decide this? I don’t know. It is a very difficult point. Although Palden Lhamo is not a protector exclusive to the Gelugpa tradition and does not have any connection with Je Tsongkhapa and his two sons, the omniscient Gendun-drub developed a special relationship with her. Based on this he appointed Palden Lhamo as his principal protector. Gendun Gyatso went to Drepung and became the Throne Holder (Abbot) there, after which he also became Throne Holder of Sera, so he was Throne holder of both Drepung and Sera. Thus it came about that in Drepung too Palden Lhamo became the principal protector. In later times, since Sera and Drepung had many branch monasteries, like limbs throughout Do-töd, Do-med and many regions of U-tsang, Palden Lhamo naturally came to be protector of many Gelugpa monasteries, Likewise, Nechung Dorje Drekden naturally became connected with many Gelugpa monasteries that were related to Drepung. Due to their special relationship with Drepung, Tashi Kyil, Kum-bum and their many subsidiary monasteries also adopted Palden Lhamo as their protector. Wasn’t there such a relationship even in Da-Korey (in Mongolia) end up to the border of Khoten? Anyway that’s a different story. There’s no need to explain it now. So, Palden Lhamo and other transcendental deities like her are a class of protectors to be placed in the merit-field, and to be relied upon by individuals. There is no reason to place everyone in the merit-field. If one places worldly protectors amongst the protectors in the merit-field, there is danger of losing one’s refuge. Aren’t there accounts of such things in the religious histories which are said to have been related by the Seventh Dalai Lama, Gyalchok Kelsang Gyatso and Purchog Ngawang Jhampa? Therefore one should not place worldly protectors in the merit field. For example, according to what I have just said, speaking truly from my own point of view Gyalpo-ku-nga (the Five State Guardians) are protectors exclusive to the Ganden Phodrang Government, but still, because they appear in the form of wrathful worldly protectors and are included in that class, if I were to place them in the merit-field I would contradict the refuge precepts. Do you understand? This is a fact. In a definitive sense for instance, Gyalpo-ku-nga are said to be emanations of the Five Buddha Families, and in fact they are. However, in the view of common beings they have arisen in the form of wrathful deities for specific reasons and purposes. Therefore, in relying on them we should consider then as wrathful according to worldly conventions and not say that because they are somehow different in their definitive sense we should offer our heads and bodies to them. This is the way we should propitiate and seek the protection of various wrathful deities, we shouldn’t offer our heads and bodies and so forth to them, should we? Here too there is a danger of making mistakes by following what merely appears to be good. Specifically, for whatever reason, whether it is something related to the common cause of Tibet, or to those of you who have come from Tibet recently and for some reason have to stay here, or to those of you who are settled in India, there is a reason for us to be gathered here. Those of you who are settled in India know very well why I have had to repeatedly talk about this matter, there’s no need for me to say it again to you, for you it is old hat and I neither wish nor feel comfortable about going over it again. Yet, as the Dalai Lama, although I am not qualified, I am the only person to uphold the common cause of Tibet, and when something falls from the right, who offers support from the left? Because this relates to our common cause I have no choice but to talk, even though it may seen like a slap in the face for some. Anyway, there have lately been some problems concerning the protector Gyalchen Shugden, those of you who live in India know well about this and I don’t have to repeat it to you. But, if those of you from Tibet simply accept him merely on the basis of his reputation as a great protector of the Gelugpas, it will not do any good for Tibet, either religiously or politically. This is a clear fact and I need not go into the reasons. As I have already mentioned, one should rely on the category of wrathful protectors according to the form in which they appear to the disciples. As this is the case and as the most inconceivable matters are beyond our perception, the situation will only change when we have gradually gained insight into wisdom and method on our mind streams and have reached a point where we are individually capable of analyzing each and every situation with wisdom. Until we reach a point where we understand the most inconceivable secrets, we must go along with what conventionally appears to us as disciples, according to the level of the purification of our perception, mustn’t we? Therefore this is the basis on which I’m talking to you now. When we speak of the origins of the present Gyalchen Shugden, he arose out of a conflict with the great Fifth Dalai Lama, not out of his closeness with the Fifth Dalai Lama. The Fifth Dalai Lama was the founder of the Ganden Phodrang government and because of that, even today people in Tibet refer to me as Gyalwang (Powerful Lord) Tenzin Gyatso, although I’m not up to the job especially in the present crucial circumstances for Tibet. I am the person who has to bear the responsibility, although I am not capable, yet due to my prayers in past lives and due to my special karmic connections with the Tibetans in general, I was selected as a small boy in a remote part of Amdo as the reincarnation of Gyalwa Rinpoche (the Dalai Lama), and so I came to central Tibet. So, whatever I am as an individual according to the level of my own personal practice, from amongst the common mass of Tibetans I have come to sit on this throne of the Dalai Lamas. By holding the position of the Fifth Dalai Lama I am supposed to follow what he did, this is the reason I have to interfere. Due to the antagonism between the Ganden Phodrang of the Fifth Dalai Lama and the Upper chamber of Tulku Drakpa Gyaltsen and because of inner and outer inauspiciousness this problem arose. There is no reason why I personally should say “Gyalchen Shugden you have done good or bad” – for I personally do have some relationship with him, but after some time it became inappropriate in my dealing with questions of Tibet’s religion and politics. Not only that, but even in terms of merely Gelugpa matters it seems there is some problem in the context of Damchen Chögyal’s position. Therefore, we should deal with these things based on an awareness of their conventional appearance to ordinary disciples. We Gelugpas consider the validity of conventionality to be very important, don’t we? When we speak of the validity of conventional appearances the importance lies in the perception of the initial level of beings. Why? – because reasons should accord with the principles of causality, shouldn’t they? This is how the lineage explains it. The Dzogchen view is explained primarily from the viewpoint of the result that is sought; when Sakyas explain the view of the clarity and voidness of the inseparability of cyclic existence and the state beyond it, they do so mainly from the point of view of the mode of apprehension that a yogi has through his practice of the path. Isn’t Jamgon Lama Tsongkhapa Chenmo’s view like this – the view of conventional validity is explained primarily from the point of view of the mode of apprehension of a sentient being on the ordinary level, isn’t this the lineage of explanation? – it is. These are some points to think about. Anyway, what I have just explained is something we should be aware of. The personal case of each individual is completely different, you have freedom to do religious practice or not do it, it is simply a matter of personal freedom whether you rely upon any kind of meditational deity or protector. There is no one to trouble you. But when it cones to common issues such as the religion and politics of Tibet, and also common issues for the Gelugpas it is different. As I have just explained, when it comes to the common issue of Tibet’s religion and politics, Palden Lhamo is the principal and those connected with her, such as the so called Gyalpo-ku-nga and Den-ma Chu-nyi, also become principal. When it comes to the question of Gelugpa, Dam-chen Chögyal is the principal, then Mahakala/Gompo – yes, Dam-chen Chögyal is the principal. This is the point you should understand, as I have just explained. When I speak of these things it hurts your ears, doesn’t it ? So it is said to be very dangerous to place worldly protectors amongst the ranks of the merit-field. But one thing I have heard, in the regions of Kham there are people who make 100,000 tsok offerings to Gyalchen following someone’s death, don’t they? On the one hand there may be good reasons for this, but on the other, if I were to make an immediate response based on the general presentation of Buddha’s teaching, it is improper. There is [unreadable word] one thing I should tell you, we are not forbidden to rely on these categories of wrathful deities, local protectors and earth deities, we are permitted to propitiate then. But when propitiating them, we do so in the way we would treat our close friends. For instance, if we hire a worker we give him food, and we would ask him to help for just that day, which is not like relying on a guru or even like a refuge. We simply hire a fellow. Similarly, offer a torma to those wrathful deities at the place where you practise and seek their virtuous activity. It is permissible to rely on them in this way – do you follow ? Until lately in Tibet we had a custom of making incense offerings (bsang gsol) this is very good. If I were to comment on this only from the viewpoint of the actual teaching of Buddha, then there’s not much emphasis on the practice. Yet this word sang has the connotation of purifying impurities. In view of this, it has a substantial ability to purify impurities such as impure obstructions, degenerative obstructions, antagonistic obstructions and obstructions from (breaking) pledges. Generally, for instance, if there is a bad smell in our room or on our clothes and we burn incense it will counter the smell. Such things are purified due to the reality of interdependence and through the power and blessing of concentration, which gives rise to benefit. Not so long ago, to be frank, Tibet was full of such obstructions as I have mentioned, for this reason performing incense offering was beneficial. For the Chinese in particular it represents Tibetan religious faith, so this is good, isn’t it? In reality, speaking from the heart of Buddhism, for Tibetans to cry “Lha-gyal-lo” “May the Gods be Victorious” is not sufficient. When we went to Ladakh we cried out “Ki-Ki so-so, Lha-rgyal-lo” “Hurrah, hurrah, may the Gods be Victorious” and at that point I said that if by this god we meant the “god amongst gods Munindra (Buddha Shakyamuni)” (Thub dbang lha yi lha la phyag ’tsal lo) then it was good to say this. Otherwise, as the Dalai Lama is said to be a Bhikshu, wouldn’t it sound strange if he said, “Ki-ki, so-so, lha gyal-lo”, to an approaching mountain protector? Once, Tri Rinpoche (Ling Rinpoche) told me, a god came from the vicinity of Reting, Trijang Rinpoche told me the same, and when asked who he was, he said he was Geshe Potowa. And what was he wearing? – he was wearing the hat of a mountain protector (btzangzha) and sitting in a cave claiming to be Geshe Potowa. Now, isn’t this enough, “From the syllables HUNG hook like light rays radiate”. That’s that. Now, the Four Great Kings are worldly protectors. There are worldly and transcendental protectors of the directions and of the worldly ones there are those of the white side and those of the black side. There are many types. On some occasions when there are many deities like this, it [unreadable words] in the way you project and preconceive them just as we say “there is no phenomenon not projected by conceptions and if something is projected by conceptions it doesn’t necessarily exist in that way.” So what is the case with these things? Sometimes even I don’t know. Though a distinction may be made between worldly and transcendental protectors, even amongst the Four Great Kings, these universally acclaimed great kings touched the feet of Buddha Shakyamuni when he was alive and they were bound by oath and given instructions by him. In this way the Four Great Kings were like friends assisting the Sixteen Arhats, so, don’t they have some sort of responsibility for the flourishing of the Dharma? If I speak loosely they are old gods, like old men who have personally met with Buddha Shakyamuni and who he personally appointed to be protectors of his teachings. So, they are quite necessary, but because they are not suitable to be placed amongst the transcendental protectors of the merit field, they are placed amidst the clouds in the four directions around the merit field, – do you understand? When we recite these lines we say “from their natural abodes,” which is easy to understand, isn’t it? If you can meditate on the three doors of the members of the merit field as marked by the three vajras – that’s good. What are the views of this? Also, why depend on Nechung if he’s not enlightened, unlike Dorje Shugden? Don’t know about Nyatrul. But I would be careful with such claims of taking over the Nechung oracle. There were also made a lot of claims about Shugden replacing Nechung etc but these are just propaganda claims. Whose group is benefitted by claiming a take over or replacement? This is the right question to be asked. The pro Shugden camp wants more status for their protector because it gives them more weight / political influence. Tsem Tulku is inventing stories, turns things upside down, I decided to ignore him to save my precious lifetime. If you want to understand why the Gaden phodrang relies on Nechung you have to read history or the accounts given by the Dalai Lama. There is a closer karmic relationship to Nechung than to Shugden. Shugden is not considered to be enlightened but to be a vengeful spirit – also Trijang Rinpoche says this (a trouble making samaya breaker who he claims is at the same time a manifestation of Manjushri as a harmful spirit). Only a few guys claim Shugden is enlightened and this view is not only marginal and controversial, it’s also of recent origin. Sorry for commenting on an old thread, but as far as I know the Dalai Lama has recognized Tsem Rinpoche as a Tulku, and has not since said anything to the contrary, despite his practice being controversial. So I would not say he is a “self appointed” guru. There is no proof the Dalai Lama has recognized Tsem Rinpoche as a Tulku or proof of his numerous other fancy claims to be Prince Iska Minh and Drakpa Gyaltsen–or even having finished high school in America. If you can produce letters and evidence, Kyle, please do so. According to his own account, The Dalai Lama ordained Tsem in 1987, some luminary within Ganden Shartse named him the 25th Tsem Tulku at a later date. That would mean his life spans were pathetically short, since there have only been 17 Gyalwang Karmapas, the first nirmanakaya lama in Tibet, several centuries older than minor Gelugpa lines. It is ironic that Tsem uses the name of the Dalai Lama to enhance his own prestige, while attacking and undermining him on a daily basis on his Chinese-sponsored websites. Self- aggrandized might be the word we’re looking for here.